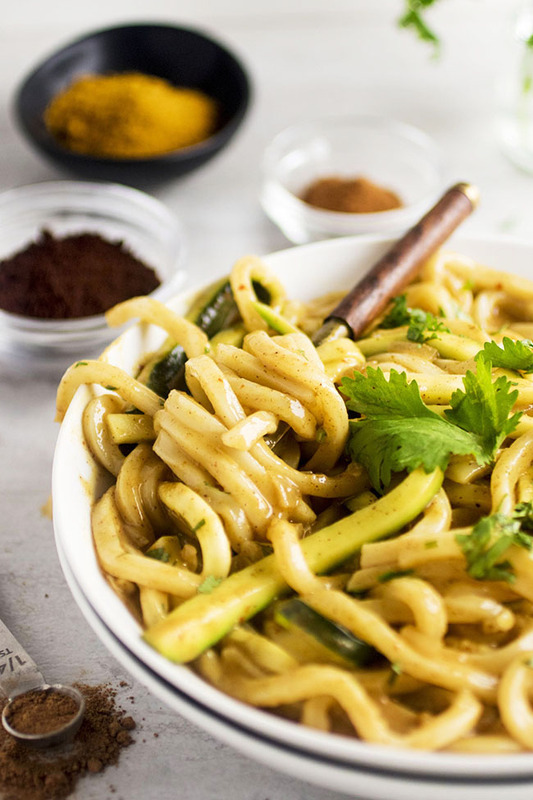 These healthy udon and zucchini noodle curry bowls are perfect for Meatless Monday (or any day of the week!) 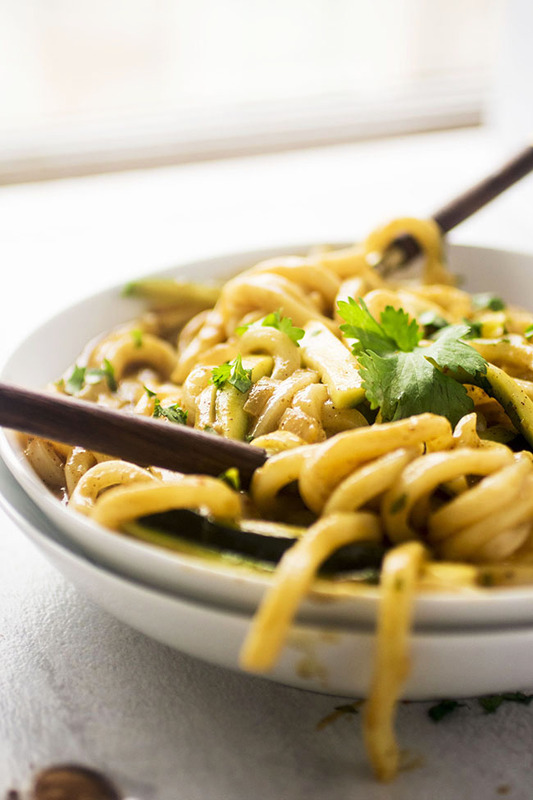 Fluffy udon noodles and fresh zucchini noodles (without a spiralizer!) make for a filling, quick meal with a flavorful homemade curry sauce. Remember when I jumped alllllll over the zucchini noodle bandwagon? It sort of kind of a little bit happened again. But not to fear, fellow carb-lovers! It’s a little more carb-o-rific and a little less zoodle-y this time around, because instead of going full zuke-a-doodle-noodle I mixed some thick-cut zucchini with fresh, fluffy udon noodles. Sooooo…carbs. But also vegetables! Which means more room for cupcakes, yes? 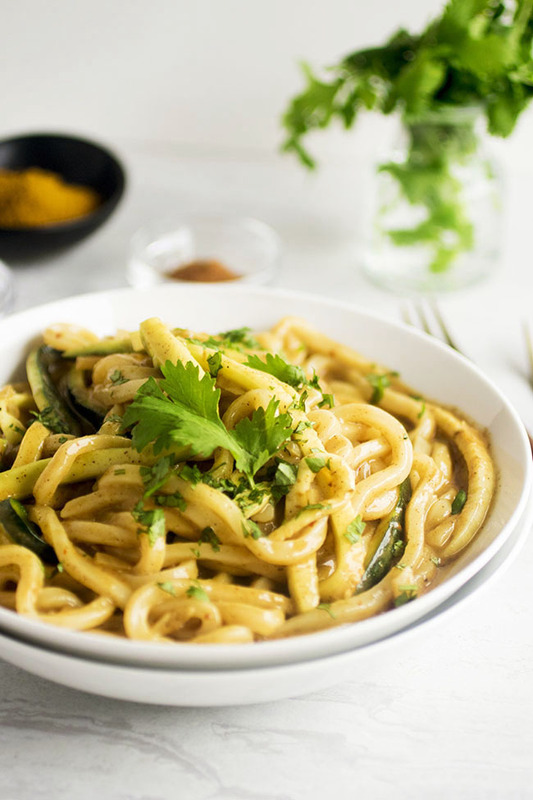 This recipe comes together soooooooo quickly – just 10 or 15 minutes of prep and another 15 minutes or so of cook time – and you’ll only need one pot (BOOM) because the noodles cook right in the scrumptious coconut curry sauce. 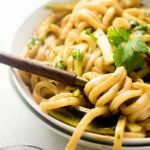 These Udon and Zucchini Noodle Curry Bowls are easily customized – throw in a few handfuls of whatever veggies (carrots, red peppers, etc. etc.) you’ve got lying around! Other great additions would be crushed peanuts for some extra texture, a few slices of grilled chicken, or a bit of fresh fish or shrimp for a heartier meal. Also, please please pretty please use FRESH (not dried) udon noodles for this recipe. I buy these frozen udon noodles at Wegman’s, but if you can’t find them at any of your local places there are some similar ones here on Amazon. ⬇⬇⬇ Isn’t this just begging you to swan dive right into it? READYSETGO! Easy vegetarian noodle curry bowls – perfect for Meatless Monday! Add onion and garlic and sauté 2-3 minutes until onion is translucent. Add salt, pepper, and curry paste to pan and stir to combine. Add curry powder, cumin, cinnamon, cloves, and nutmeg to pan and stir to combine. Let cook for 1-2 minutes until spices are toasted and fragrant. Add water to pan to deglaze and stir to combine. Make sure to scrape up any browned bits from the bottom of the pan – that’s where the flavor is! Add lemon juice and coconut milk to pan, stir to combine, and bring sauce to a simmer over medium heat. 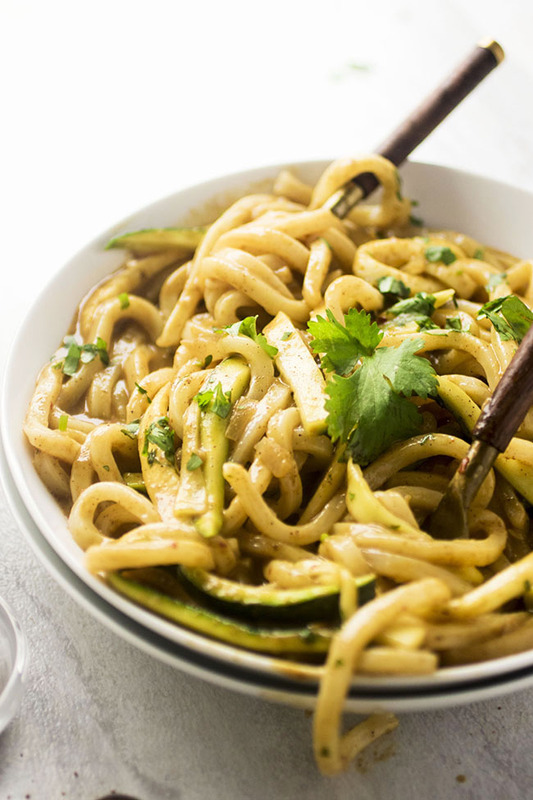 While the sauce is heating up, slice your zucchini into thick matchstick-style noodles. You can use a spiralizer for this if you have one, but I just use a knife or the thickest slicer blade on my mandolin. 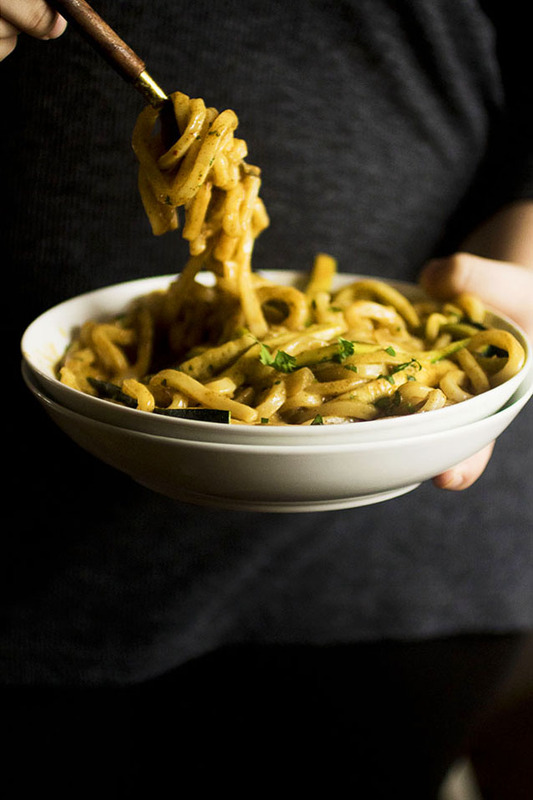 You want the zucchini “noodles” to be roughly the same size as your udon noodles! When sauce is simmering, add fresh udon noodles and stir to combine. Cook according to package directions until noodles have cooked through (usually about 5 minutes). Remove pot from heat and stir in the zucchini noodles. Top noodles with fresh cilantro and serve immediately. Use FRESH udon noodles (frozen is ok) instead of dried noodles in this recipe – they taste so much better! I buy frozen udon noodles at my grocery store, but if you don’t have the thick, chewy udon available to you Amazon has a similar package here. Use whatever veggies you have on hand in this recipe – add some peas, bell peppers, or anything else you need to use up. For extra protein, throw in some grilled chicken, shrimp, whitefish, or tofu. First time to ever cook or taste Udon noodles. This dish is very flavorful. You can taste all of the spices with each bite. Also, sprinkled some small sesame seeds on this after I had tasted it because I know the Asian dishes do this with many recipes and it was good. The Udon noodles, to me are a different thickness and taste than regular American noodles. Hope to enjoy this recipe again in the future! Hello Diane, so happy to hear you enjoyed the recipe! Oh gosh so good! I was amazed at how good frozen udon noodles are when I first tried them. So much better than dried. The photos are amazing. Thank you so much! And I agree – those fresh/frozen udon noodles were life changing! Looks seriously delicious. 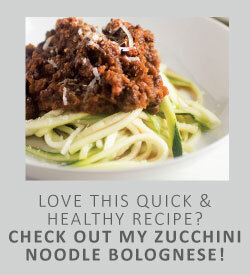 And i prefer the noodle to zucchini ratio any day! UR PHOTOS ARE AMAZING JESSIE 🙂 AND THIS FOOD WILL SURELY TRY! I LOVE CURRY!